Having been moved to another parish, TD Hogan's sneering Sarah Carey won't be reporting this. 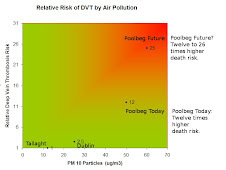 Neither will DCC funded Professor Tol Pot of ESRI who is too busy promoting incineration and censoring comments on the Irish Economy blog. US Scientists say there is no safe level for dioxins. Nevertheless politicians set a convenient "safety level" totally independently of industry money and golfing events. 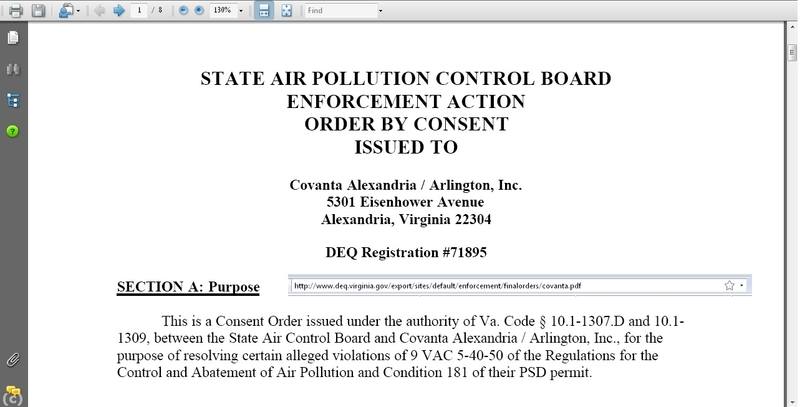 Covanta has a 25 year record of violating air pollution laws. 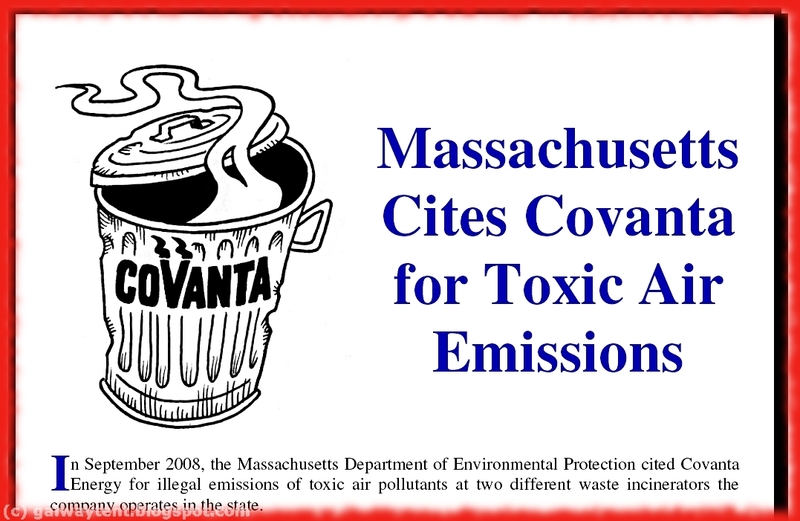 Below is a recent report about reckless Covanta dioxins releases in Connecticut. Click here for a report from 2010. Guess what these cowboys will do to the health of the one million people around Dublin Bay. 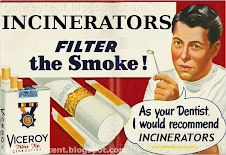 The US energy firm behind plans to build the Poolbeg incinerator has been ordered to pay $400,000 after releasing cancerous dioxins at one of its facilities. 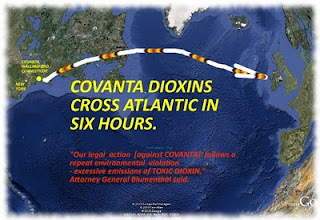 Covanta, which has plans for a €400 million incinerator at the Dublin site, was found to have released dioxins 250 times greater than allowed safety levels. The US company has agreed to a fine imposed in a settlement reached July 14 with the Connecticut attorney general and the state’s department of energy and environmental protection (Deep). 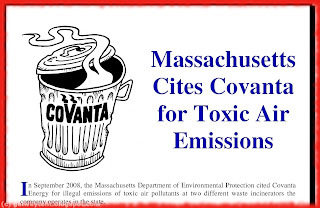 Connecticut officials said it was the second time that Covanta has been fined for emissions from facilities in the US state. The latest fine related to the emission of unsafe levels of dioxin from its Wallingford plant. The facility was closed for nearly a year following a annual routine test in July 2010 by the company’s own inspectors which revealed dangerously high levels of carcinogenic dioxins. The exposure to dioxins emitted by the plant at the high levels involved had the potential to result in reproductive or developmental side-effects, according to the U.S. Environmental Protection Agency. ‘‘As this was the second violation of its kind in the past few years, there is no margin for error here - Covanta must get it right," Deep Commissioner Daniel Esty said in a statement to media. 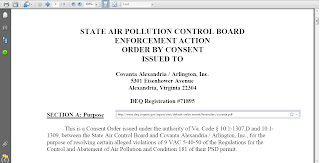 Two years ago, Covanta paid $355,000 to the state arising from unsafe dioxin emissions which were discovered coming from its Wallingford plant and another similar facility at Hartford, Connecticut. A Covanta spokesman said that the Wallingford plant had safely resumed operations in July after dioxins tested below safety limits. The firm is now also obliged to conduct more periodic tests on dioxin emissions. Covanta operates a total of 44 such facilities in the US. Covanta’s Dublin project has been stalled due to problems with the previous government, negative court judgements which have affected the company’s business plans, and resistance from within the waste industry. © Thomas Crosbie Media 2011.